Director Tran Anh Hung’s 1995 film Xích Lô is widely regarded as his masterpiece. It’s a seminal piece of filmmaking, presenting a lurid and picture of an under-documented stage in the country’s history, beauty and ugliness both in abundance in every oversaturated frame. Xích Lô follows the story of a young boy forced by poverty into driving a traditional Vietnamese rickshaw (the titular xich lô.) The film chronicles his descent into a criminal underworld filled with vice and violence, showing the poverty and brutality behind the stylish sheen Anh Hung paints over the top of the city. The film uses the Xích Lô rickshaw as a Sisyphean burden dragged by the protagonist, his source of sustenance and of suffering. It is stolen and attacked, and long shots expose the weight of the decrepit vehicle and its opulent passengers. In the film’s shots form open apartment windows, we see half-empty streets, a few lonely bikes cruising past, no sign of the coming crush of traffic that now casts a haze across the city. Tram Anh Hung’s decision to name and model his film around this Vietnamese mode of transport is inspired, and the story of the Xich Lo and it’s spiritual successor, the xe ôm, reveal a great deal about the last half century in Vietnam. The few Xich Lo that remain are novelties for tourists, their drivers elderly men with teardrop calves, stoically steering between BMWs and 4x4s. 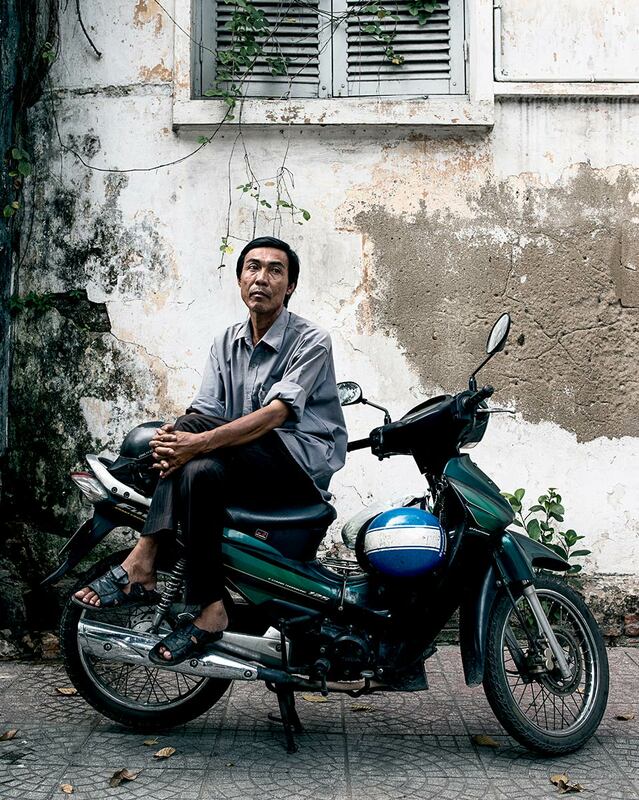 Like gió mùa, the yearly monsoon rain, Honda Waves and Dreams washed the Xich Lo from the streets of Vietnam. The horsemen of the industrial age were the xe ôm drivers, astride sputtering motorbikes that outpaced and outshone the traditional rickshaw with ease. Xe ôm (literally “motorbike hug”) are taxi drivers who operate independently, carrying paying customers who sit behind them, new arrivals often literally hugging for stability. The first xe ôm drivers were, at heart, venture capitalists with access to the means of transportation, their position entwined with the arrival of the almighty American dollar. Whether the connection between the xe ôm drivers and vice industries was there since the start, as Mr. Luan suggests, or solidified through years of crafty extortion is a moot point. But the reputation of the xe ôm drivers has always had a slightly sour taste, a few unscrupulous individuals with desire for short term profit leaving many new arrivals with significantly lighter pockets. 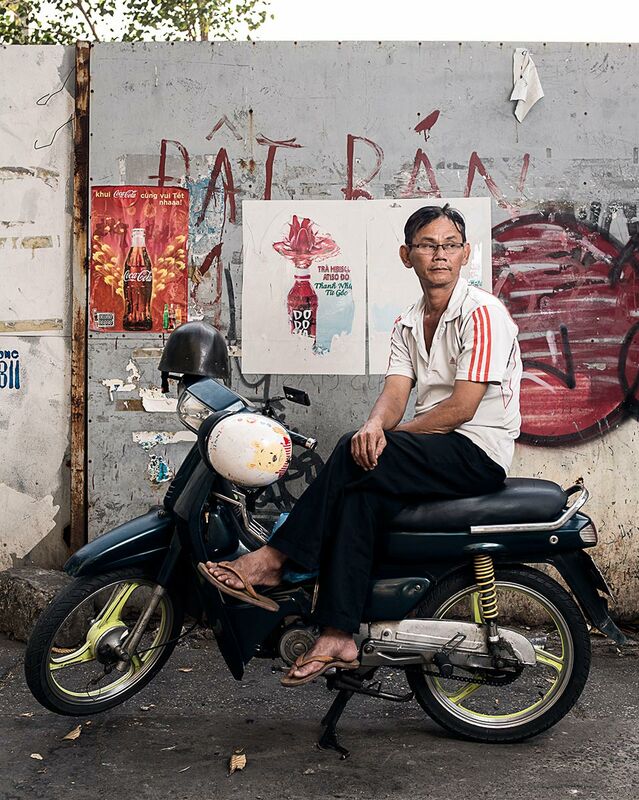 But for years, these profit margins and questionable connections have kept the xe ôm drivers in a position of relative monopoly in Vietnam’s large cities. Change came suddenly. In May of 2015, just as the first drops of gió mùa monsoon rain began to fall, a hungry startup called Grab introduced a motorbike taxi service operated through smartphones. Grab were granted governmental permission to operate, and soon Uber had joined the for-profit party with UberMoto in Hanoi and HCMC. Suddenly, young men and women2 in corporate uniforms were scooping up passengers left and right. Many were delighted to be driven driven by a sober young driver with access to Google maps and accountable to a rating system. For some women especially, this new accountability was a paradigm shift, introducing new levels of safety to a previously seedy process. Just as Xich Lo’s protagonist is driven into the criminal underworld against his will, most Vietnam residents will have heard their share of xe ôm horror stories, and the possibility of a ride home turning into something darker. While xe ôm drivers are still a trusting tourist’s first point of interaction with locals, the behaviour of a few may lead to prejudice and antagonism, exacerbated by falling profits. Both Grab and Uber have driven prices to remarkable lows in order to gain market share, and the era of the xe ôm driver began to look less unshakeable. Now a fifteen minute ride cost somewhere in the region of 20k, equivalent to a morning coffee. Grab now gets more customers than traditional xe ôms, with billboards over the city, green helmets splashed across streets and an easy to use interface with a range of transportation options. Tuoi Tre magazine estimates there being at least 20,000 motorbike drivers using apps such as Grab and Uber3. The damage was done. Vietnamese news source Tuoi Tre quoted a 62 year old xe ôm driver named Minh, operating in Binh Thanh District. Mr. Minh states that he earned over VND100,000 per day before ride-hailing apps arrived. 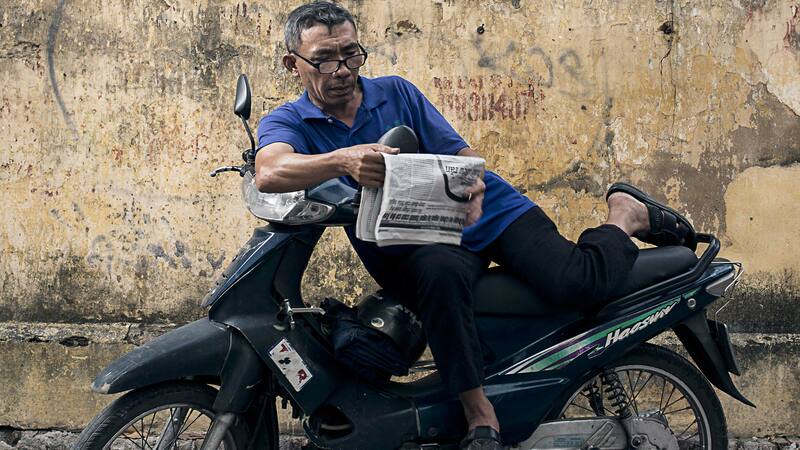 “Now with these new apps, I’ve only gathered VND10,000 this entire morning.” Saigon local Vu Tuan Anh refers to the traditional xe ôm drivers as “threatened by these modern platforms”, as many lack the technological nous or means to take advantage of smartphone technology. Such is the fate of comfortable monopoly. While some traditional drivers have established unions in order to improve their professionalism and service, others have chosen violence. Last year, sixty-five HCMC GrabBike employees reported assaults from xe ôm drivers, a staggering number considering how many may have gone unreported. Of these attacks, almost half were committed at Tan Son Nhat Airport, with many more around Pham Ngu Lao and Bui Vien, the heartland of tourism, and prime xe ôm territory. Astonishment at the low prices of a half hour journey by motorbike often leads to tipping, especially from the lucrative ex-pat market, at a rate that can almost double a driver’s income. Short waiting times between bookings mean that a well caffeinated and efficient driver can pull in over 300,000 VND ($15) a day. For comparison, the average monthly salary in today’s HCMC is $145. The significance of this story is global. The story of the xe om driver is a paragraph in a book that is still being written, the book of the sharing economy and a paradigm shift in how labour is transformed. Airbnb revolutionised hospitality when people realised they could use their houses as hotels, and Grab and Uber turned family motorbikes into money making machines. The consequences have been severe. In Britain, black cab drivers rioted and blocked off streets4. In America, Uber and Lyft are fighting tooth and nail for market share. Violence and threats from the old guard are desperate solutions for industries that once relied on specialist knowledge, now outsourced to machines. London cab drivers spent years memorising every street in the city. Now everyone’s phone does the same trick better. The same rain that now threatens the xe ôm driver hangs heavy over the heads of truck drivers, factory workers and shop assistants across the globe. From Xích Lô to xe ôm to GrabBike, the story of Vietnam is being written. With the bizarre latest proclamation by Dr. Luong Hoai Nam, who argues that that a complete ban on motorcycles is the answer to Ho Chi Minh’s traffic problems5 (cars, infrastructure, poor enforcement and cars are the real culprits) the future is impossible to predict. Plans for the pedestrianisation of parts of District One may mean that the Xich Lo and other rickshaw style vehicles see a resurgence6. But the heyday has come and gone, and the future is rushing to fill the gap. In one scene in Xích Lô, the protagonist violently grabs a lizard with his fist, causing it to panic and lose its tail. But Vietnamese lizards regrow their tails, and for a country well used to such stories, violence is simply a painful byproduct of metamorphosis. It is not the role of a society to place the interests of the few over those of the many, whether those few are at the top or bottom. And for a nation that must take care to solidify its image as welcoming, the predatory xe ôm driver with an exhortative attitude can undo fifty positive interactions. Perhaps the best that the xe ôm can hope is that they are immortalised with the same level of craft that Tram Anh Hung gave to the Xích Lô driver, warts and all. For now, Grab and Uber have the streets. But nothing lasts forever, and no one can say with certainty when the next rain will fall. Translated from a chapter of the book “Saigon Chuyen Doi Cua Pho” (Saigon, Stories of a Metropolitan) by journalist Pham Cong Luan. This piece would be incomplete without a nod to the trickle of courageous women, who have increasingly taken to their bikes to provide a taxi service on regulated apps such as Grab and Uber. Next articleIs It Safe To Travel To Vietnam?